Scrub tops are an important part of medical workwear. They are worn in nursing, in the hospital and in general practices and are very popular due to their high functionality and pleasant comfort. 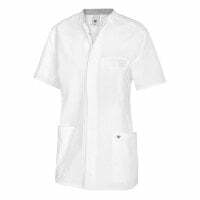 With Praxisdienst, you will find women's and men's scrub tops at affordable prices. Scrub tops, also known as tunics, are among the classics of medical workwear. 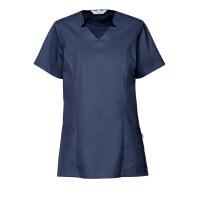 The scrub top boasts high popularity in the hospital, elder care and in the surgery. While the scrub top was once predominantly worn by women, the men's scrub top has come more and more into style over the last few years. US medical series have even strengthened this trend. Ladies scrub tops are mostly cut in a more figure-flattering style, while men's scrub tops feature a straighter cut. The scrub top is made of non-sensitive materials (mostly cotton or cotton mix fabrics) to guarantee longevity during daily medical work. 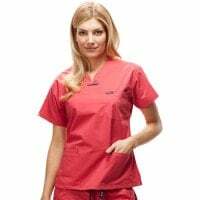 In order to satisfy the hygienic requirements of hospitals and surgeries, scrubs can be washed at high temperatures and many are even boil-proof and suitable for industrial washing. 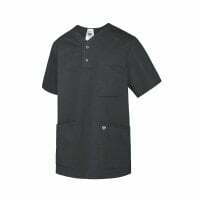 Pull-on scrubs are cut to allow one to easily pull them over the head and save time before and after work. 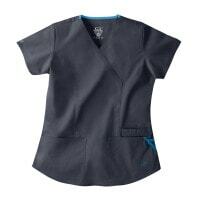 Most pull-on scrubs are cut wide enough to allow for sufficient freedom of movement in order to easily accomplish one's work. 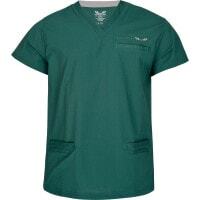 Typically, scrub tops have a V-neck, 2 front pockets and often even a breast pocket. 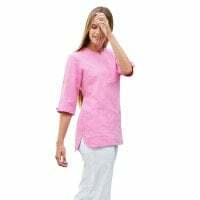 Although button-up scrub tops take more time to put on and remove, they can be worn open; therefore, they are often worn over the top of a colourful T-shirt or longsleeve shirt. Because such scrub tops do not need to be pulled on over the head, they are a better solution for lens wearers. 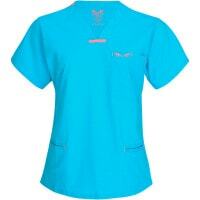 In recent years, colourful scrub tops have become increasingly popular. This is especially the case since many surgeries have transitioned into uniform office colours in order to generate corporate identity. 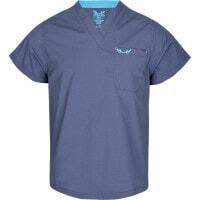 Furthermore, TV series, like Scrubs or Grey's Anatomy, have contributed to the trend of not only wearing scrub tops in hospitals, but also in general practices. At Praxisdienst, you are provided with classic white scrub tops, as well as colourful scrub tops in many modern colours. 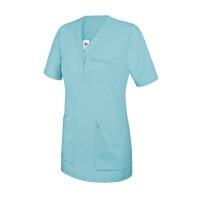 We also offer you white scrub tops with modern colour accents in a comprehensive size range. The scrub top also plays an important roll in nursing. The large front pockets allow one to comfortably carry utensils, such as a telephone, pager, pencils, notes and keys, at abdomen height without the items hindering the work procedures. 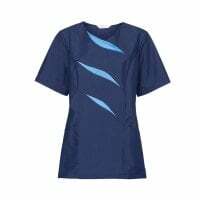 The comfortable cut means that nursing scrub tops also offer high freedom of movement, which greatly eases the repositioning and washing of patients. 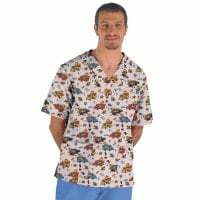 In the Scrub Tops category, we offer you a comprehensive assortment of scrub tops for men and women, pull-on scrub tops, snapping scrub tops, button-up scrub tops and nurse's scrub tops from name brands, such as HIZA, Bierbaum-Proenen, IguanaMed or Canberroo. All of our scrub tops are available in a wide range of sizes so that petite and full-figured men and women can find the ideal scrub tops. Conveniently buy the proper scrub top for your needs from Praxisdienst! Are you looking for a scrub top in a specific style, colour or size? Our customer service can advise you by email, live chat or telepone.